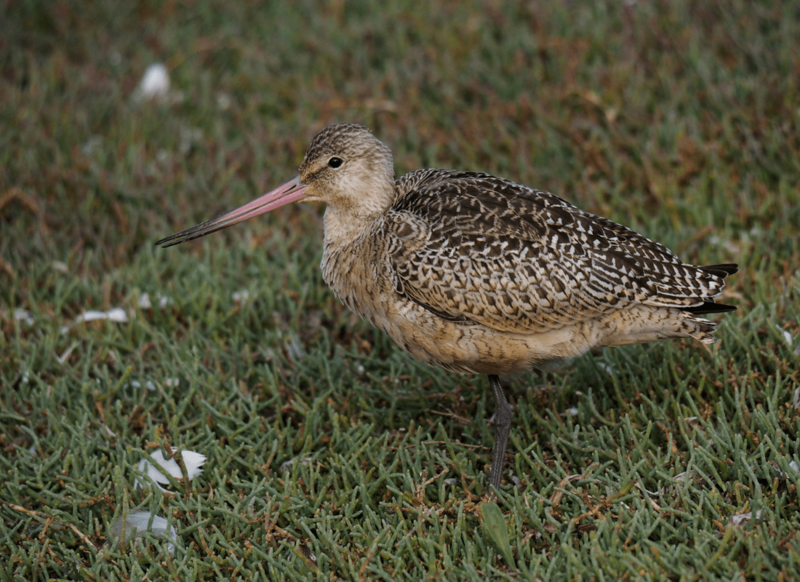 Finding a marbled godwit is rare sighting for this area. Which means it occurs most years but usually few records per year. One may go for years and never see one and only hear the rumours of one being around. 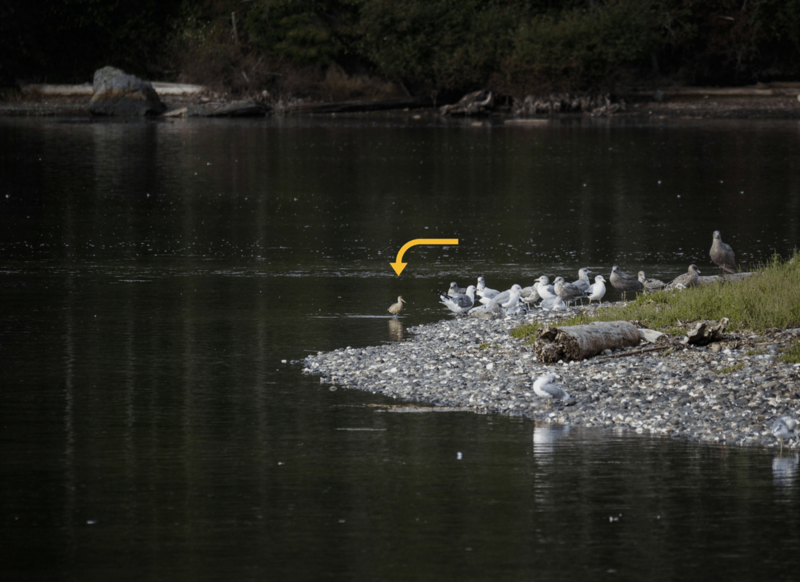 I had to go into Lanford yesterday, so I did a roundabout route and stopped at Esquimalt Lagoon to see if there were any unusual birds migrating south. 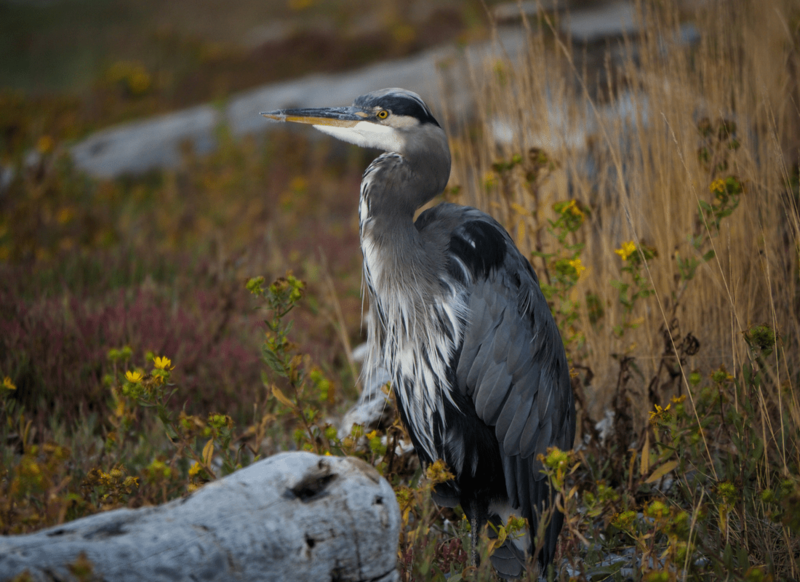 This is a good time of year in the Victoria area as the birding community is out in full force and there are lots of sightings of birds not commonly seen in this area. I stopped at what is called the hump which is a bump of land where the seagulls hang out and I could see another birder there with their binoculars. 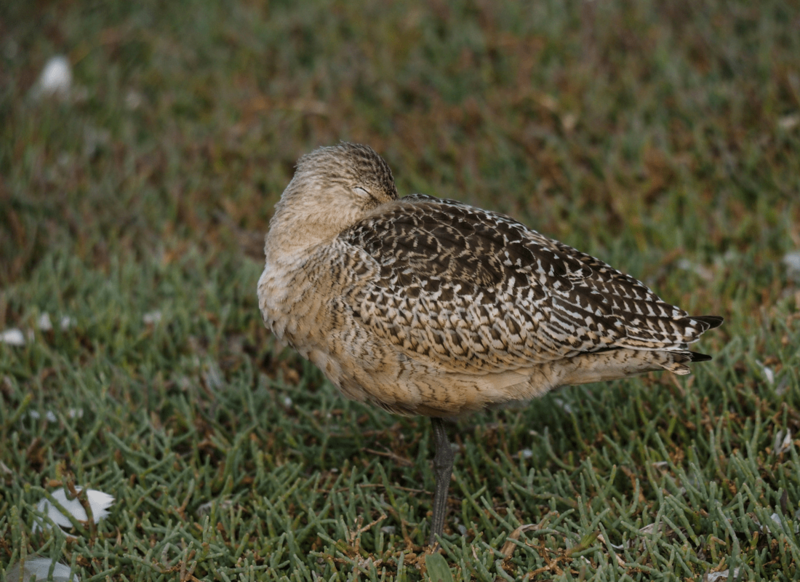 Asking him if he had seen anything interesting, he said there had been a marbled godwit there earlier, but it had flown over to the other side (Royal Roads University) of the lagoon. I had seen a Hudsonian Godwit but never a marbled one, so I quickly scooted around the lagoon, past the grocery store where I needed to stop and didn’t, just to see if I could find it. You can get a little obsessive when birding. Hunting along the shoreline at Royal Roads I walked the length of it from the stream down to the ponds at the other end of the accessible shore and not a bird in sight besides the Canada geese and a few seagulls. Ah well, I thought… that’s what happens when you’re birding. You’re never guaranteed that they’ll be there. Time to go and do the grocery shopping. Finished my shopping and as I was just about at the entrance to the lagoon again, I decided to take the circular route home. Just one last look. Stopping by the bridge I could see a few people with cameras and binoculars so I thought… Aha, what do we have here? 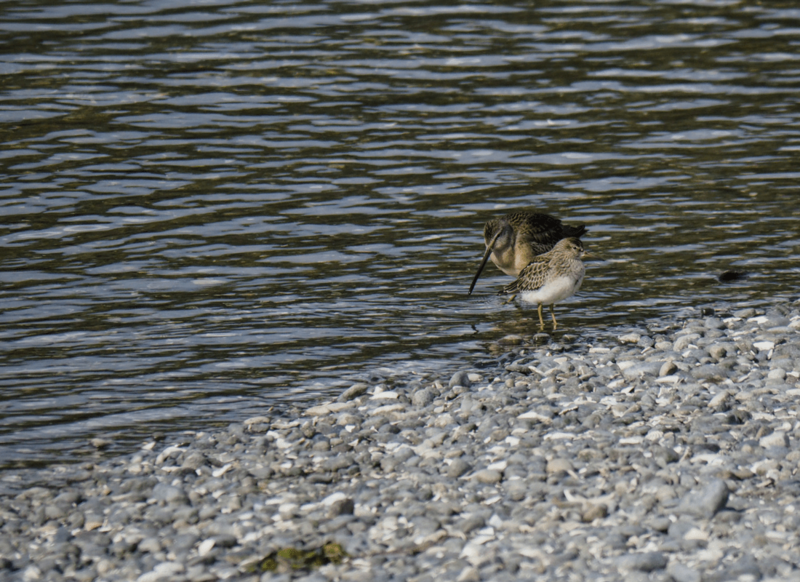 Turns out the marbled godwit had been there but had moved on again and all that was left of the exciting birds were a Long-billed Dowitcher and a Pectoral Sandpiper. Now, these were a nice find in themselves as you only see them coming through in the fall or spring as they migrate, so I was able to get a few pictures from afar before they flew away. 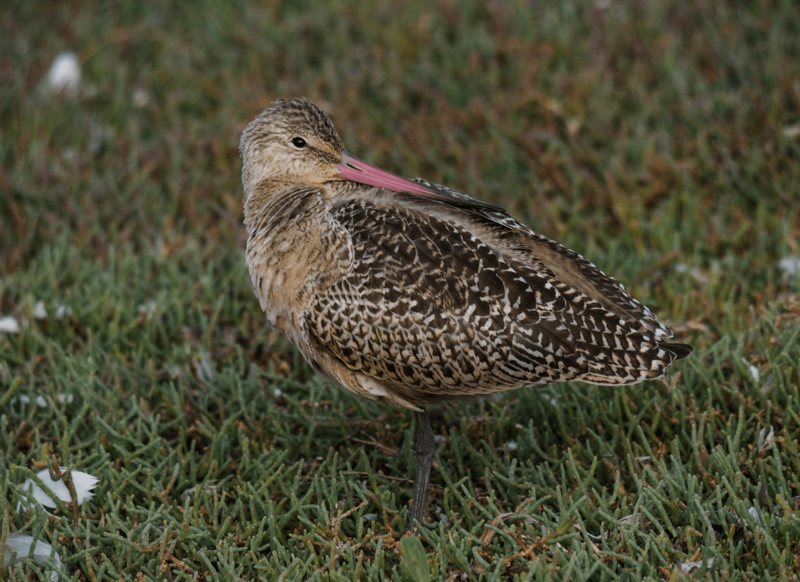 I slowly drove back to the hump where I had first started my search and found a couple who had been watching the marbled godwit and said if I went back to where the island was, it was going back and forth between the island and the shore. Alright, I thought, I’ll give this one more try. Back up the road, I went until I came to a little island in the lagoon. I plunked myself down next to a great blue heron and scanned the island for any signs of it. After communing with the heron for about 15 minutes which was so close I had to back off my telephoto lens in order to get it all in the picture I realized that maybe I was at the wrong island. There is another island down by the bridge where I was before, so back in the car, and down to the bridge. I should have called this a day in the life of a birder. I saw a man with a scope trained on the island, so I raised my camera to see what he was seeing and sure enough. There is was. 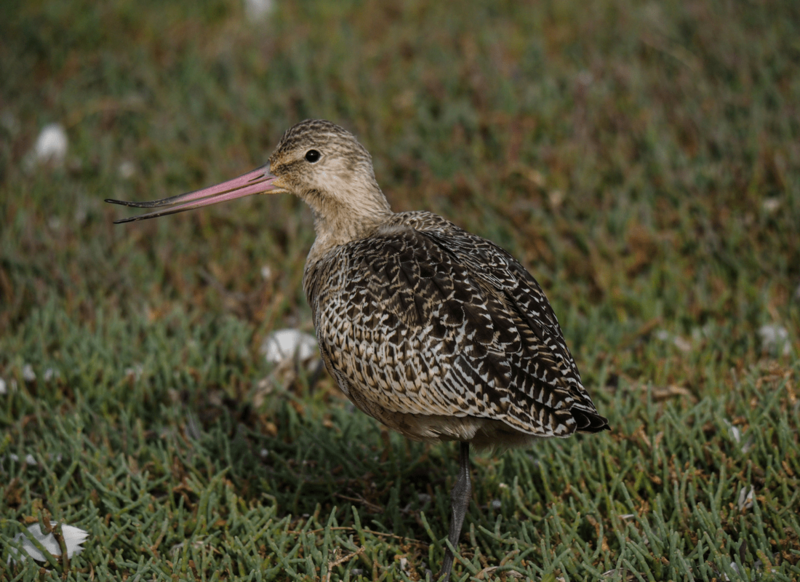 A marbled godwit! Trouble was, it was just a little brown spot with a pink bill walking around the beach. Okay for a record shot, but not anything to write home about. Minutes later, it flew off heading back across the bay in the direction of Royal Roads. Ah well, time to go home. I could spend the rest of the day following it back and forth around the lagoon and it was getting on 4:30. Driving towards home, I stopped the car at the hump and without getting out of the car scanned the seagulls but nothing unusual. Back on the road, there is another spot, where the ducks congregate, so I slowed down to look and there appeared to be a bird that looked a little different than the rest. What the heck… I turned around, grabbed my camera and got out of the car. Crossing the road I could see that it was indeed different and could it possibly be what I had been looking for all day? Its beak was tucked up into its feathers and it slept and kept watch all at the same time. As long as I didn’t disturb the ducks, it seems okay with me staying there, but if the ducks moved, it moved with them. I sat with it for about an hour until the light fade and wasn’t any good for picture taking and observed its behaviour. As it slept, a third eye that looks like a white membrane called nictitating membrane would cover its eye. Then it would open them and look around, then tightly close them again and start the process over. Quite often it would look skyward to see if there were any threats and if it saw a shadow passing overhead, it would uncurl from the sleeping position and look around. When it pulled its beak out from between its wings you can see how long it actually is. It comes halfway down its body. Once when it unfurled from the sleeping position, it opened its mouth. This was interesting because when the bill is in the normal position, it looks like the entire beak curves up. But in this shot below, it looks as if only the top of the beak curves and the bottom remains straight. 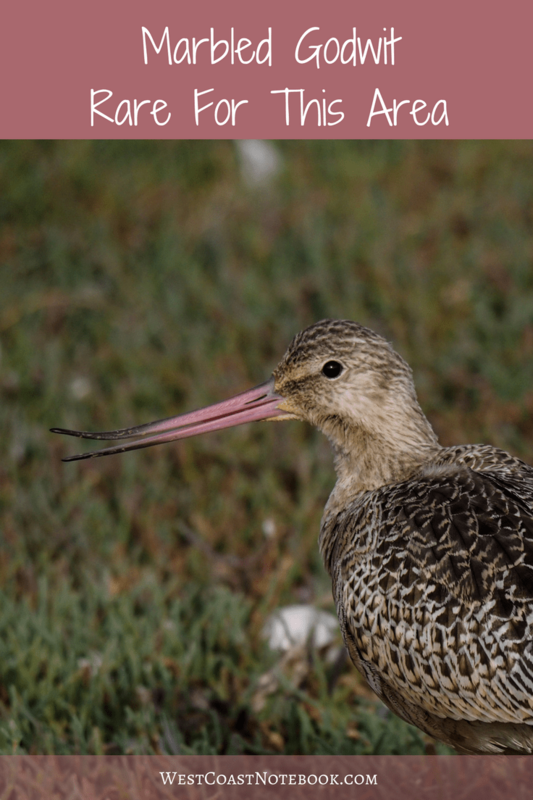 The godwit woke up again just before I left and I took one last picture and thanked it for its time and trust in allowing me to be so close (none of the pictures are cropped) and share some space with me. Today, I found a vagrant bird which is even rarer than the Marbled Godwit and it was a Lark Sparrow… more on that in another post.